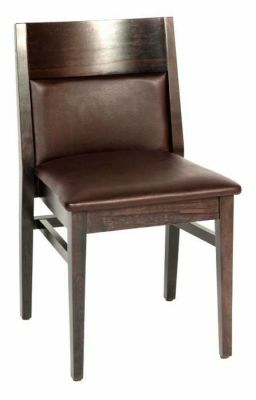 Contemporary dining chairs with wooden or upholstered seat and back. Stacks for convenient storage. Designed for use in restaurants and other commercial areas. Unique design dining chair with a chunky masculine look, constructed with a solid beech wood frame and an upholstered seat and half back. Delivered within up to 10 working days.